Joe Russo says there are hopes for an LGBTQ hero making their Marvel debut soon. Adi Shankar’s latest splashy video game adaptation is Hyper Light Drifter. One of DC’s wildest characters comes to Doom Patrol. Plus, new footage from Godzilla and Star Trek, and Shaun the Sheep has a close encounter of the third kind. Spoilers now! Joe Russo recently told The Huffington Post “I can assure you that you will hear about something very soon!” when asked if the MCU had plans to introduce a queer superhero. We’ll believe it when we see it. Annabelle comes out of storage on a new poster from Bloody-Disgusting. On the subject of killer dolls, Bloody-Disgusting also has this “elevator art” spotted at Caesar’s Palace in honor of CinemaCon. The sociopathic Superman proxy from Brightburn fashions his own serial killer mask from red velvet and shoelaces on yet another poster from Bloody-Disgusting. Lionsgate has released four new clips from Laika’s latest, Missing Link. Shazam trolls hungry Aquaman fans in a special April Fool’s Day TV spot. 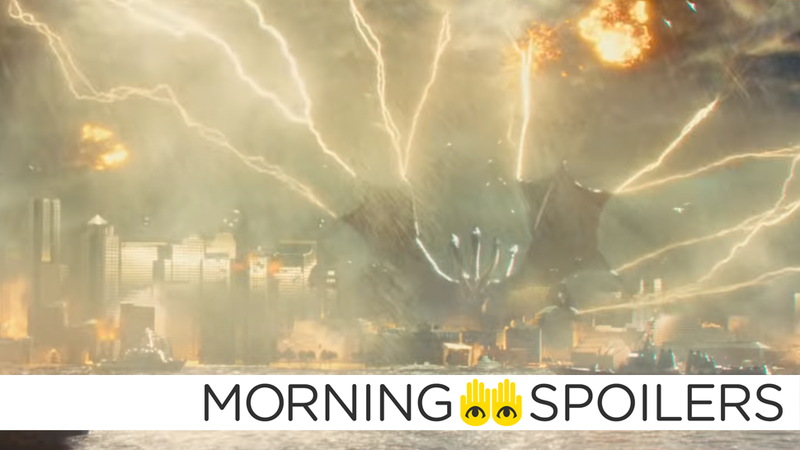 The latest TV spot reveals Godzilla: King of the Monsters features seventeen different titans. To stop an invasion, Shaun must send an alien visitor back home in the trailer for Farmageddon, the Shaun the Sheep Movie sequel. In a recent interview with CBR, Aubrey Joseph revealed the second season of Cloak & Dagger is set eight months after the events of season one. With Season 1, we literally watched them figure out how to maneuver with these powers. So Season 2, from the jump, you see them become these badass superheroes, you know? It still takes time, obviously. They’re young and they are still learning, but — specifically for Ty — eight months in a church by yourself, it’s a lot of time on your hands to practice your powers, obviously. So I think it will be worth the wait, to see that. Over the weekend at WonderCon, Marvel announced a 22-minute animated special in which Shuri learns “how to be an average teenager” from the Secret Warriors is now in development. In the meantime, here’s a trailer for the 44-minute special focusing on Riri “Ironheart” Williams airing on YouTube on April 3. Finally, Tyrion rallies the troops in the most Tyrion way possible in a new promo for the final season of Game of Thrones.